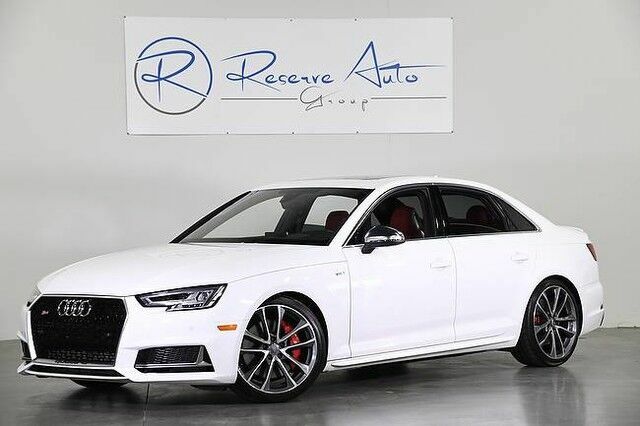 Reserve Auto Group has a wide selection of exceptional pre-owned vehicles to choose from, including this 2018 Audi S4. This Audi includes: CARBON ATLAS INLAYS Sunroof Navigation Backup Camera w/Lane Guidance heated seats Push button start PRESTIGE PACKAGE WiFi Hotspot Back-Up Camera Heads-Up Display Blind Spot Monitor Cross-Traffic Alert FINE NAPPA LEATHER INTERIOR S SPORT PACKAGE Locking/Limited Slip Differential Active Suspension WHEELS: 8.5" Tires - Front Performance Aluminum Wheels Tires - Rear Performance Call Kevin Courtney : 214-533-4286 cell/text or e-mail @ kevin@reserveautogroup.com How to protect your purchase? CARFAX BuyBack Guarantee got you covered. A test drive can only tell you so much. Get all the info when you purchase a vehicle like this with a CARFAX one-owner report. Opulent refinements married with exceptional engineering make this the kind of car you'll want to own for a lifetime. This Audi S4 is equipped with AWD for improved handling. Whether you're faced with inclement weather or just out enjoying the twisting back road, you'll have the grip of AWD on your side. Intricately stitched leather and ergonomic design seats are among the details in which test drivers say that Audi S4 is in a league of its own This wonderfully maintained Audi S4 is in the top 10% of its class when it comes to cleanliness and condition.